From his junior and college days winning golf tournaments in the Pacific Northwest, to his days on the fairways of Las Vegas’ finest layouts, writer/author Jack Sheehan has made a big impact in the golf world, most notably on the Las Vegas golf community. While he was once a standout on the links and was still a low-handicap player at the time of his induction, it’s his off-the-course accomplishments where he is all-world. 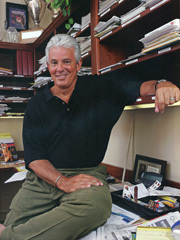 Jack is the author of 16 books, including four on golf, and two of his books have made the New York Times bestseller list. He has received the Lowell Thomas Award as the country’s best travel writer, the Nevada Screenwriters Award for best film script, and was once named the outstanding feature writer in the Western U.S. He also donated much of his time to being the master of ceremonies at countless golf events, and emceed the Las Vegas PGA Tour stop from 1990-2008. He has hosted dozens of junior golf events and has volunteered thousands of hours to local charities with his eloquence and quick wit at the microphone. During that time, he assisted organizations that raised millions of dollars for charities.